CL sure does have a lot of cool, old stuff! Thanks for bringing it to show us your collection. Omelet-in-a-Bag day went great! Cook on my peeps, cook on! Our omelet meal was the bomb – more please! Yum yum!! Happy happy birthday David! Thanks for letting us have some of your cake. Science experiment! We are checking to see if our bean seeds are still usable for this growing season. Pretty Amy with her pretty tea cup! Sherry’s in the background looking “sassy” =P. Nice pic you two! 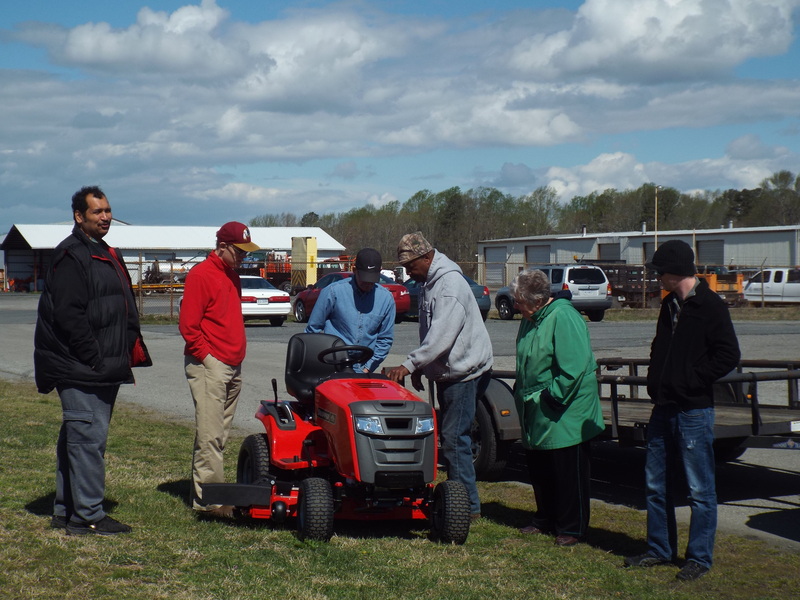 On Earth Day (April 22) No Limits Eastern Shore recruited volunteers to assist in cleaning up the Food Bank of the Southeastern Virginia and the Eastern Shores Community Garden. 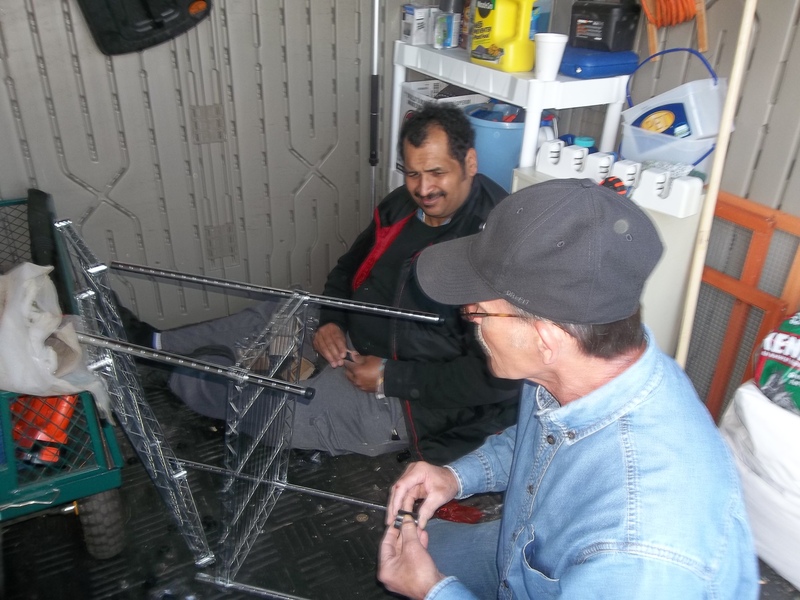 We had a great turnout and got lots of great work done. 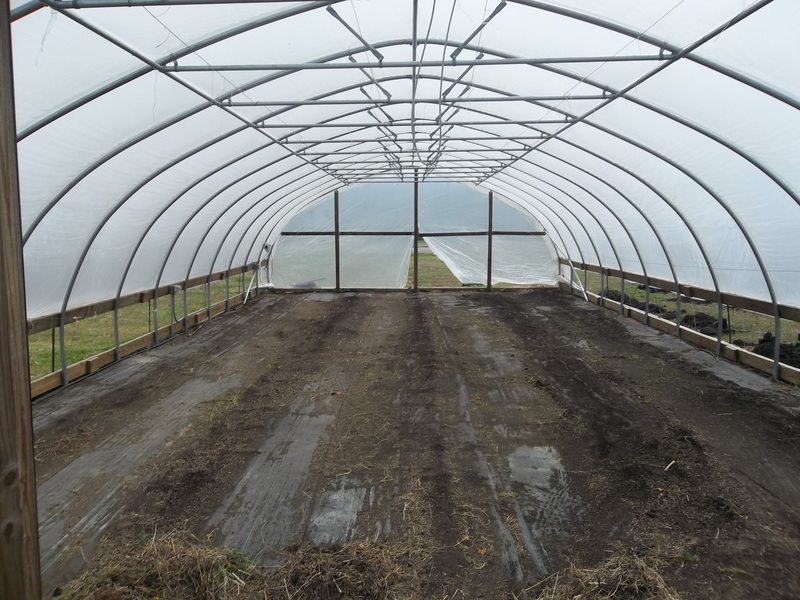 Our main goal for the day was getting the hoop house cleaned up. Thanks to all of the volunteers who came out to help. Nice work! Brandon explaining the benefits of a greenhouse. Yeah Brandon! 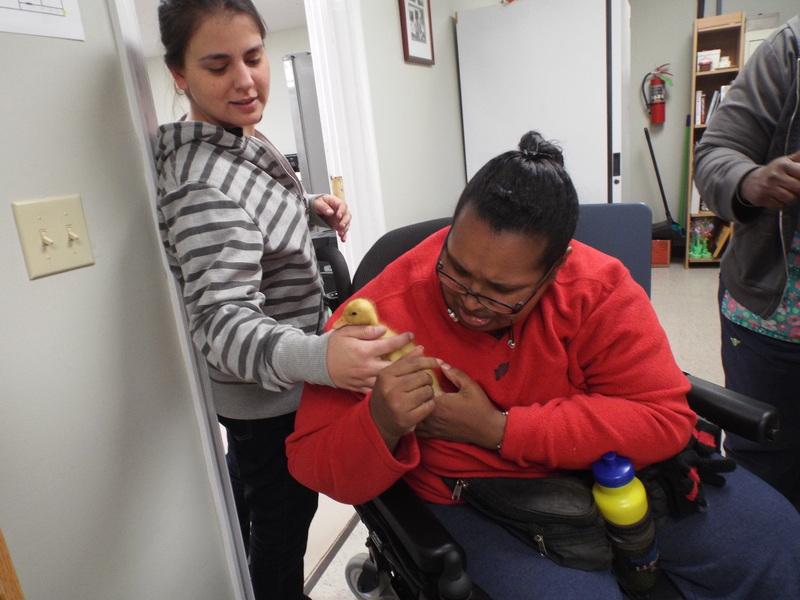 Rosemary, our Board Chair, stopped by to lend us a hand. Weed on Brandon, weed on! Don’t let those weeds get the figs. Amy and Emma workin’ hard on all the paperwork! Work on ladies! Looking good Jason! We are all really enjoying the spring weather! Woohoo! AFTER – Thank you so much to all of the volunteers who came out today and helped to clean up the Foodbank! We will have a dedicated blog post next week with ALL of our pictures. Stay tuned to see more of the hard work that was done! 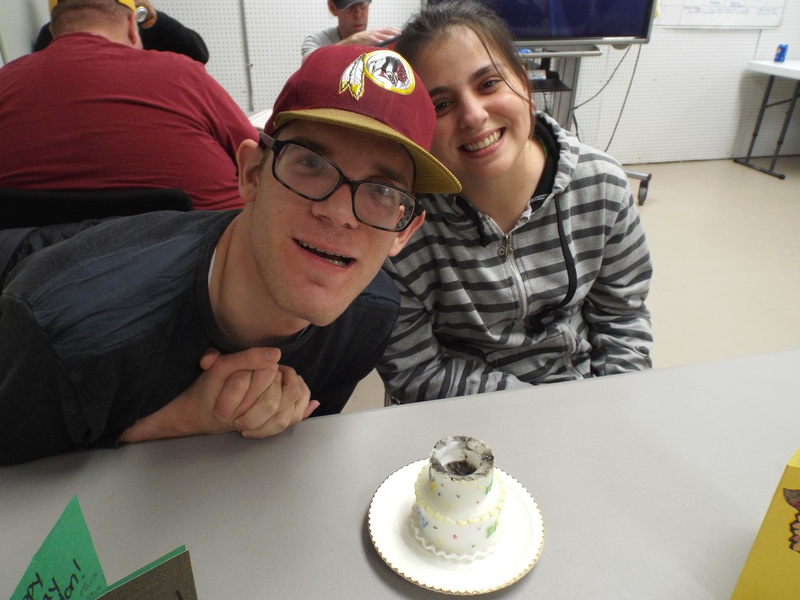 David and Maryann making a cheesecake for our April birthdays this week. We wanted more please, it was the bomb!! 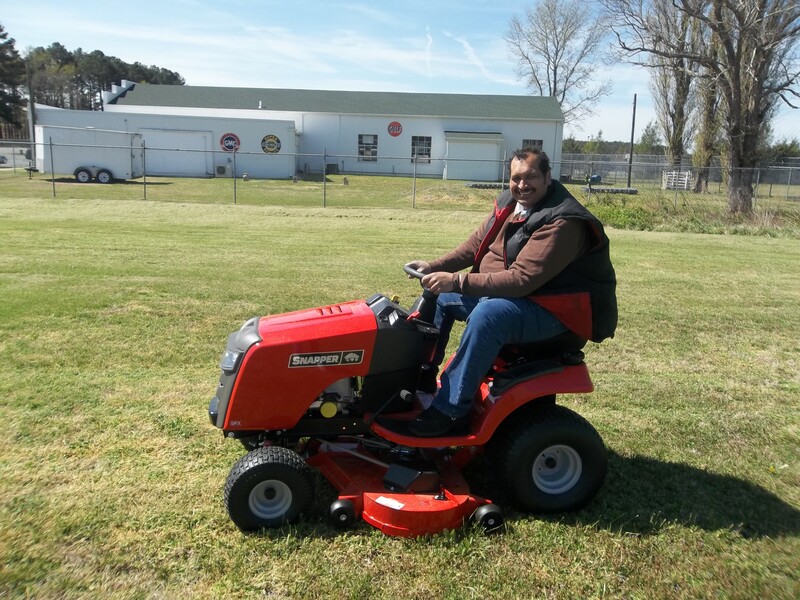 Zel on the new mower – turns out he’s a Master of Mowing!! 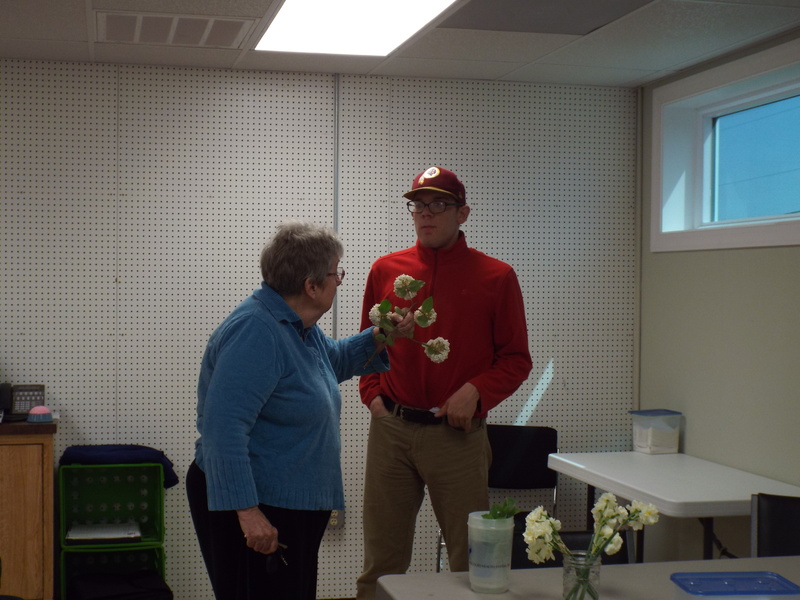 Our Board Member Rosemary brought pretty flowers in to show us. Brandon is our plant expert! 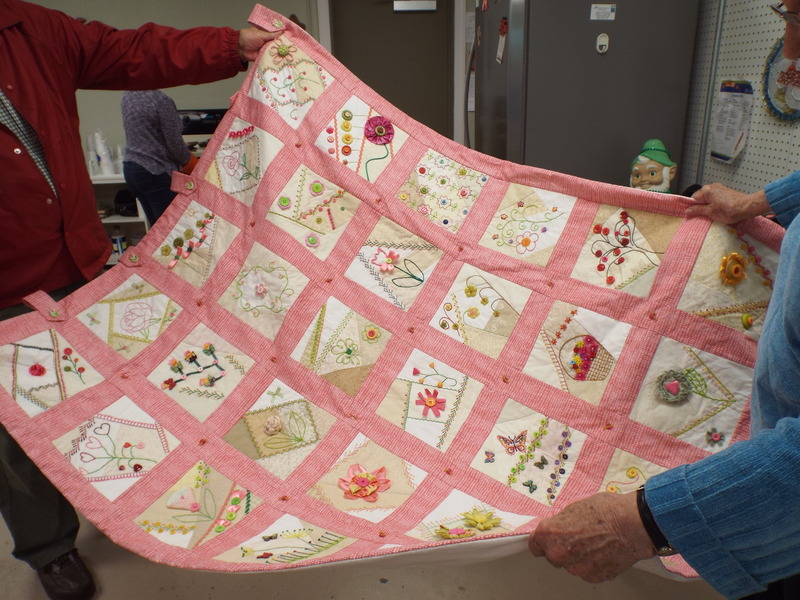 This beautiful quilt was donated to us as a fundraising item. It is awesome! 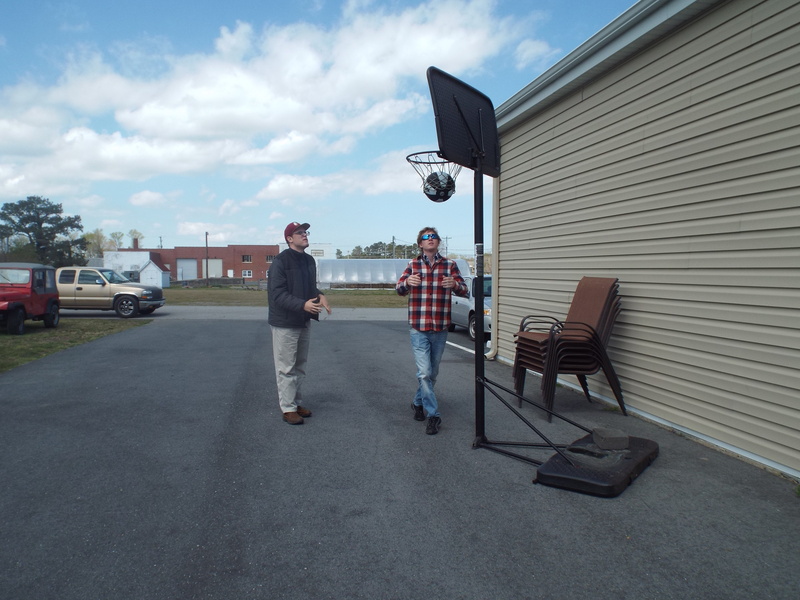 Rachel & John donated a basketball hoop to us. We like shooting hoops! 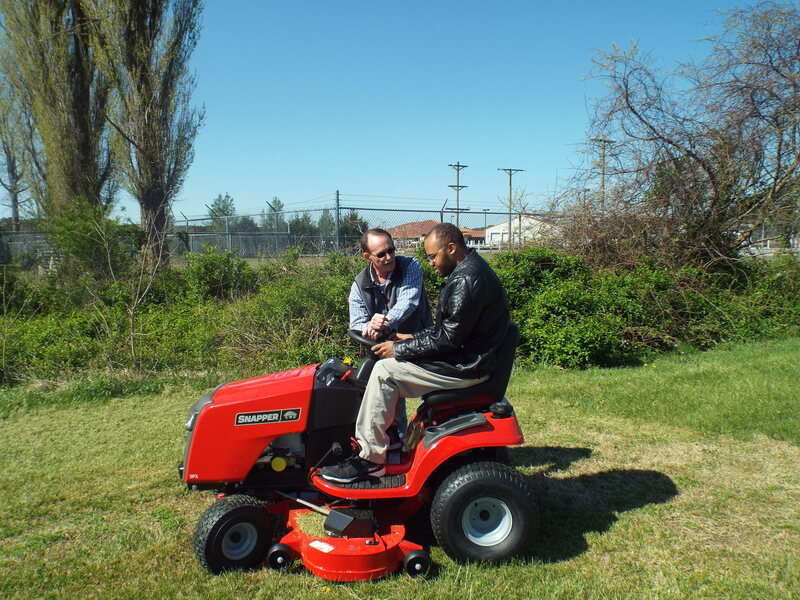 DJ learning to use our new mower. Mow DJ mow! Don’t miss a spot! 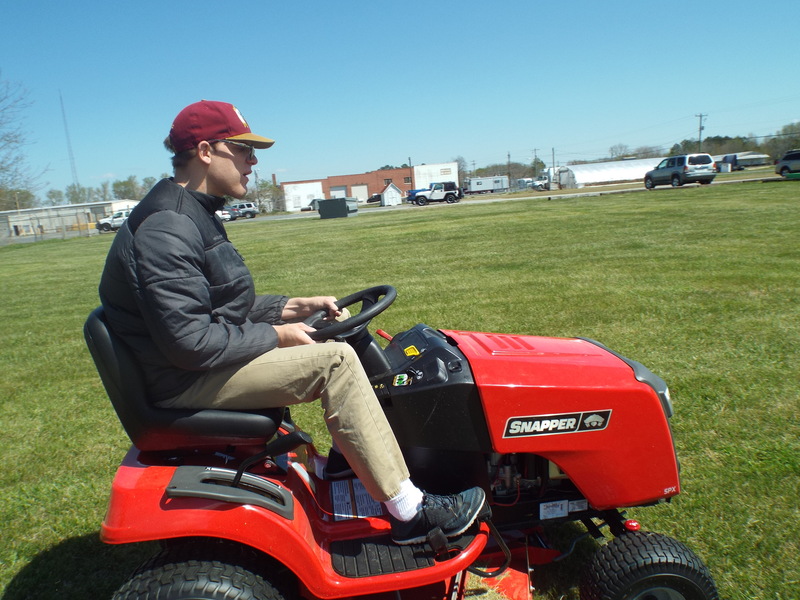 Brandon on the mower. Lookin’ good Brandon! 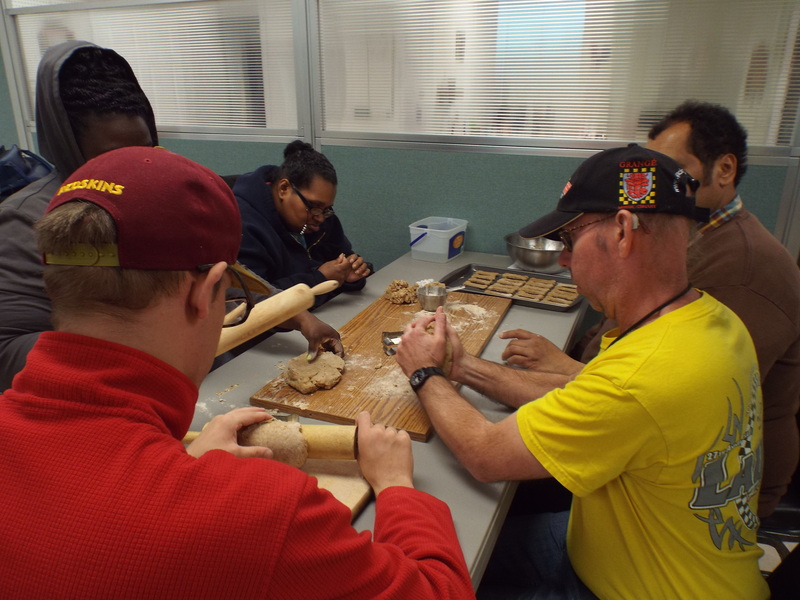 We are making dog biscuits for the pups at Animal Control. Eat on doggies, eat on – woof woof! Rachel’s husband John came in and helped out. Thank you for our new ramp!! Help Clean Up the Foodbank’s Garden! HELP!! 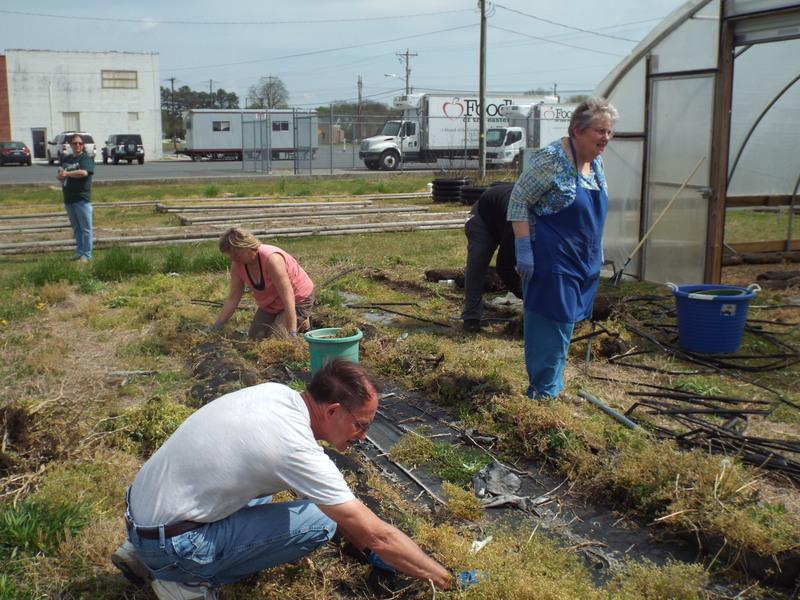 We need volunteers on Earth Day (Friday, April 22nd) to join No Limits Eastern Shore as we clean up the Foodbank of Southeastern Virginia and the Eastern Shore’s Community Garden and get it ready for spring planting! 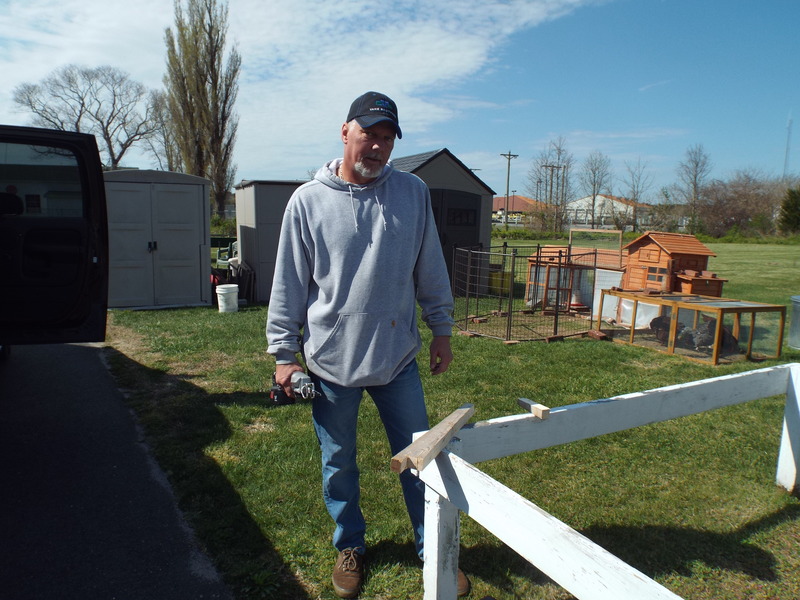 Come and get your hands dirty with No Limits in order to help your community – please bring your own hand tools and gardening gloves (if you are able). Water and resting areas will be provided. Come out and lend a hand in getting the Community Garden ready to feed the hungry this growing season. If you are unable to come out on Earth Day – no worries, you can still help! 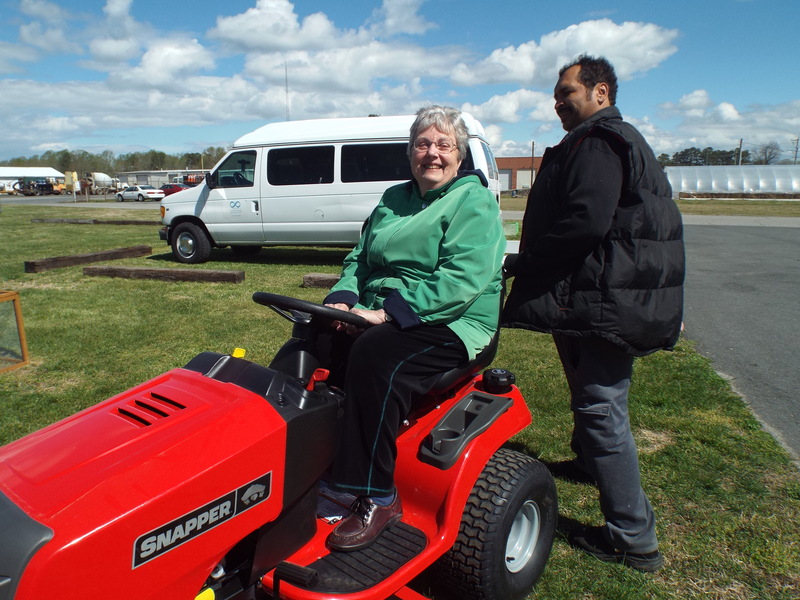 Please contact No Limits Eastern Shore (757) 789-3990 or the Foodbank of Southeastern Virginia at (757) 787-2557 to learn about other volunteering opportunities. 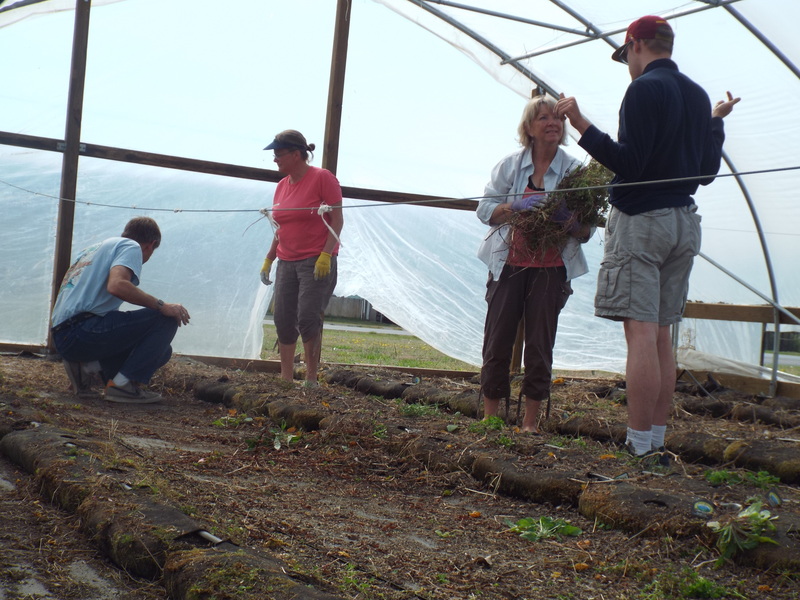 Brandon & DJ volunteering with others to care for tomatoes in the Foodbank’s Hoop House in June of 2014. 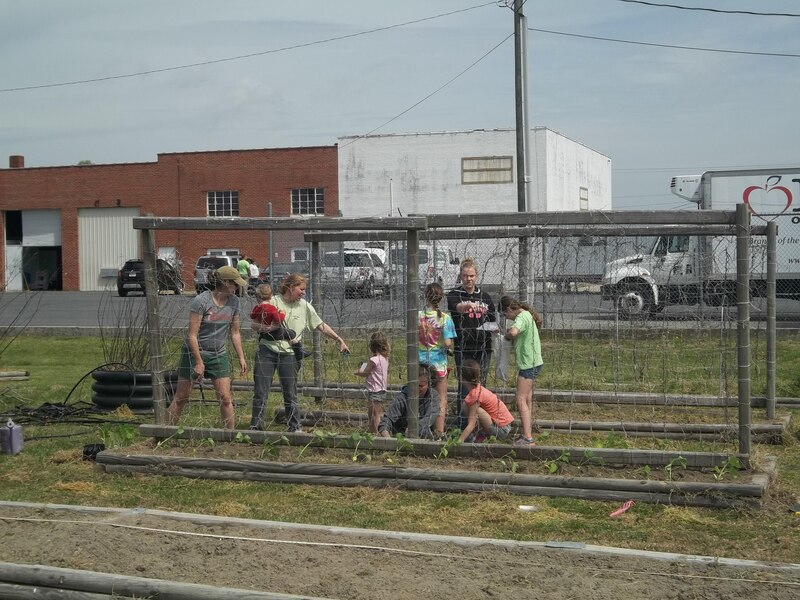 Save the Date – Earth Day Foodbank Garden Clean-Up! Earth Day 2016 – Friday, April 22nd! 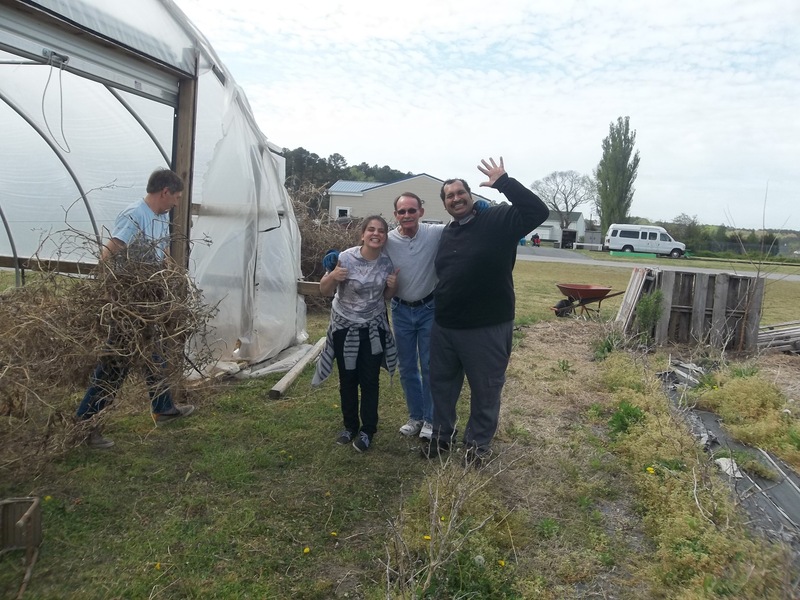 A day to help clean up and prepare the Foodbank of Southeastern Virginia and the Eastern Shore’s Community Garden for new planting! 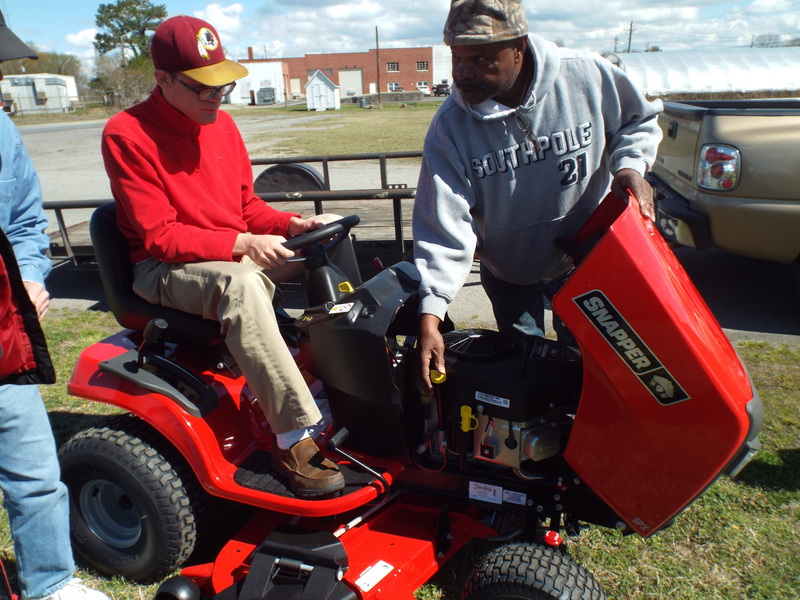 A valuable educational tool providing workshops and teach-ins for all community members on the Eastern Shore of VA.
To learn more about the Foodbank of Southeastern VA’s Community Garden please click here: http://www.foodbankonline.org/EasternShore/ProgramsAndServices/Community%20Garden.aspx. David posing with zucchini harvest from the Foodbank Community Garden in June of 2014. The Foodbank of Southeastern VA provides food for the hungry in the cities of: Norfolk, Portsmouth, Chesapeake, Suffolk, Franklin, and Virginia Beach – as well as the counties of: Southampton, Northampton, Sussex, Isle of Wight, and Accomack. Did you know that the Foodbank© of Southeastern Virginia and the Eastern Shore helps to serve approximately 182,000 hungry individuals each and every year by providing hunger relief in the form of canned, boxed, fresh, frozen, and prepared food? 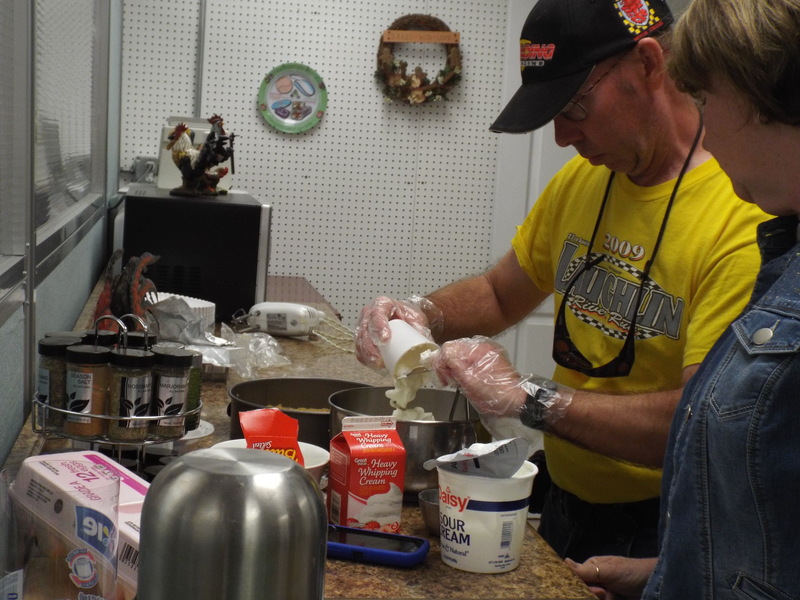 Through a variety of programs designed to feed the hungry the Foodbank© of Southeastern Virginia has served over 245 million meals to those suffering from food insecurity to date. Please save the date and come help do your part to end food insecurity in Southeastern Virginia and the Eastern Shore! 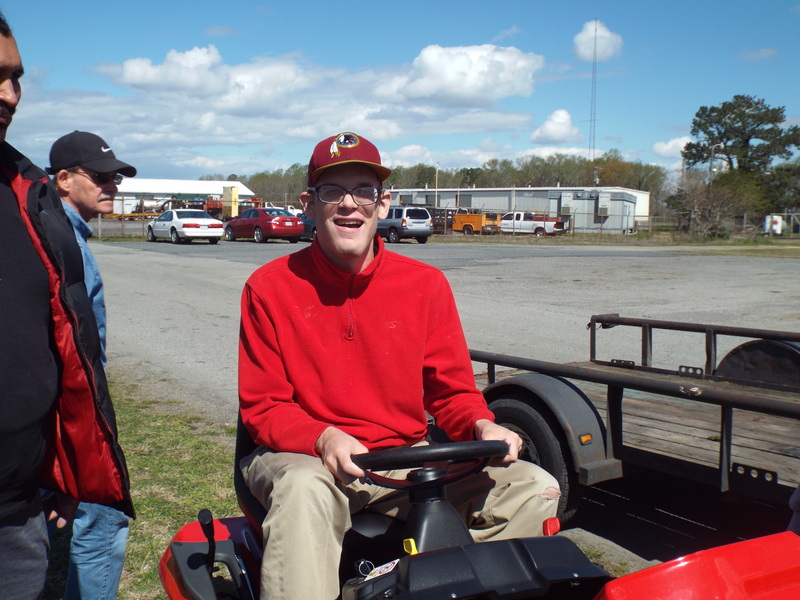 Brandon amazed about the amount of weeds that can grow in one Spring season (April 2014). 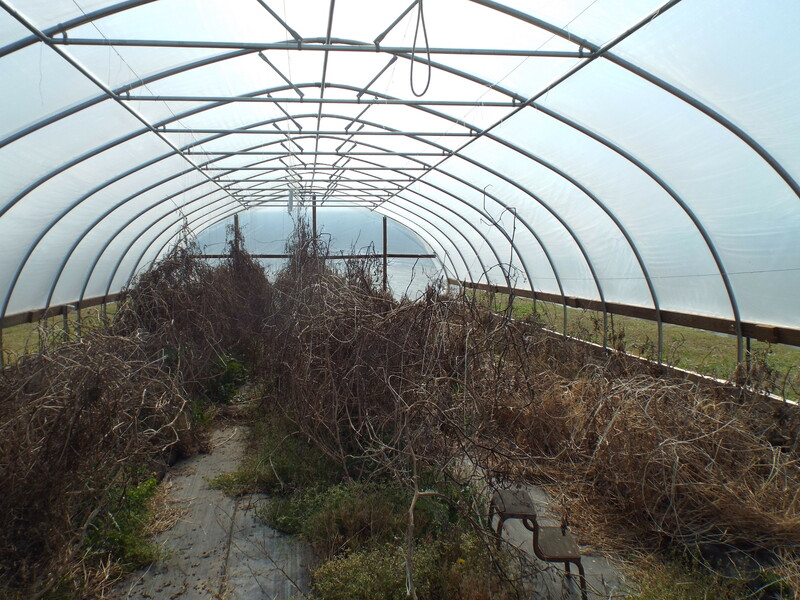 We cleared the Community Garden then and we can do it again this year! Please come help! Our new Lawn Mower arrived today. Red Rider is ready to go. 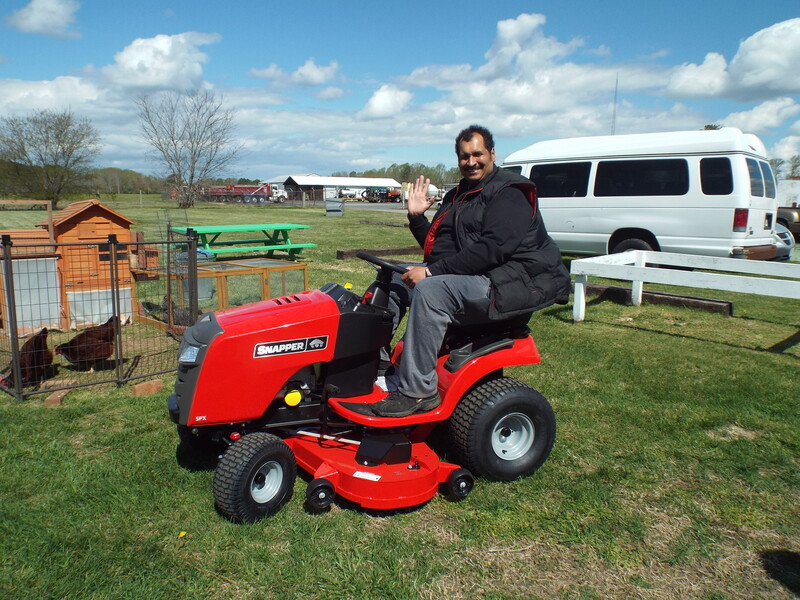 Lets take a ride on our big red tractor. 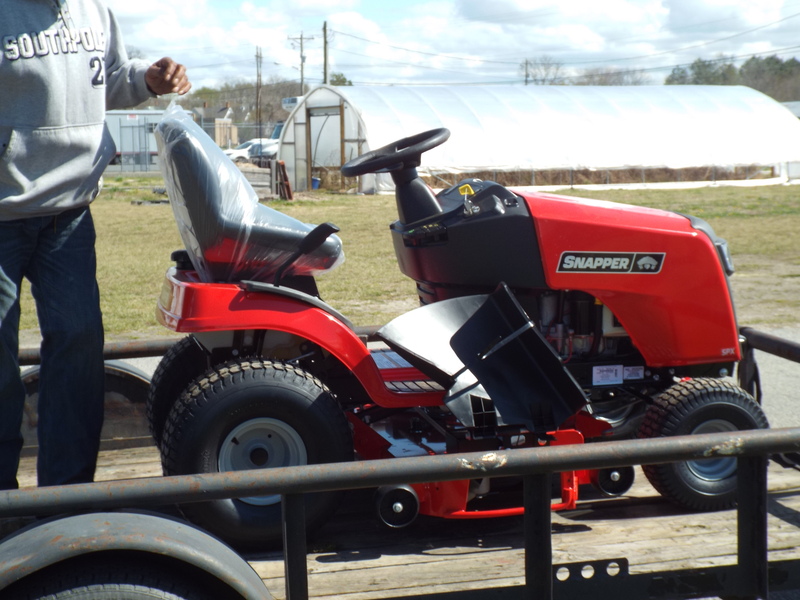 Brandon sits tight learning the ins and outs of of the new mower. Cut Brandon cut! 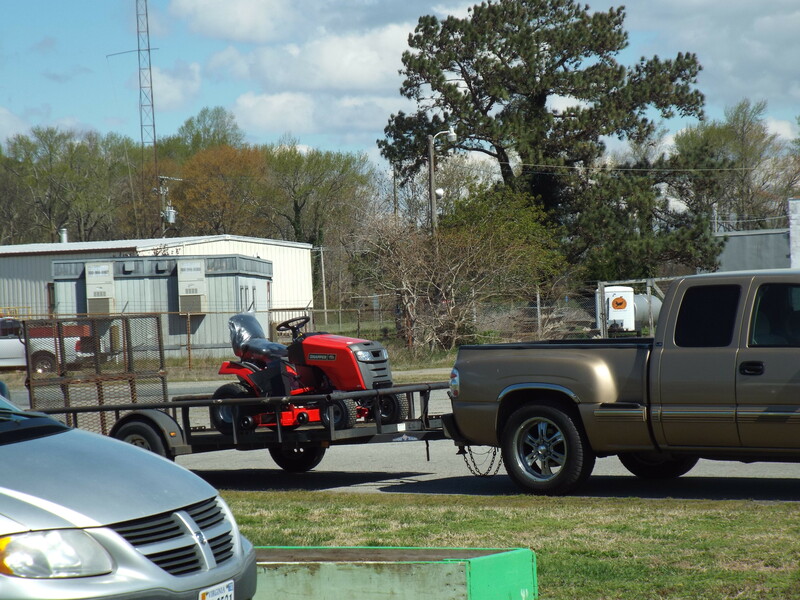 He’s ready to cut some grass. Cut on Zel with your bad self. Rosemary was excited to see our new machine. 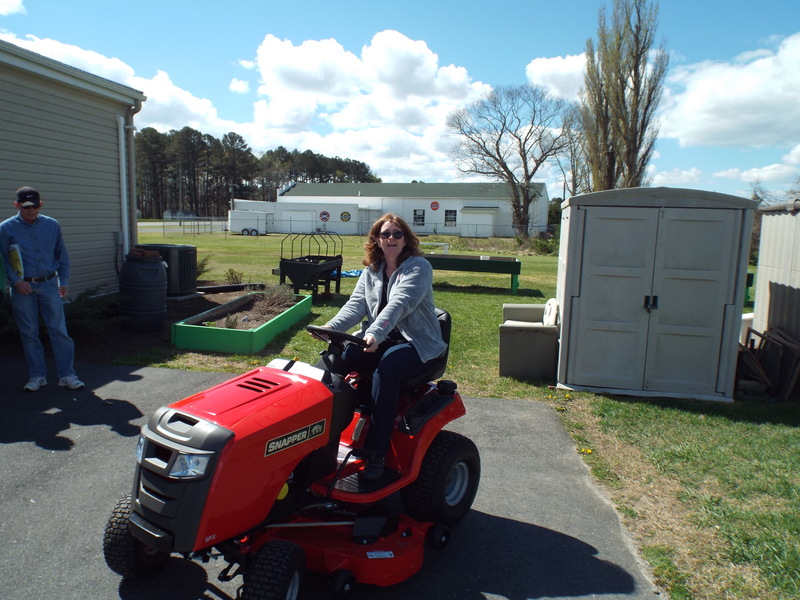 Rachel was very excited for the new lawn mower so we can cut our big new yard. 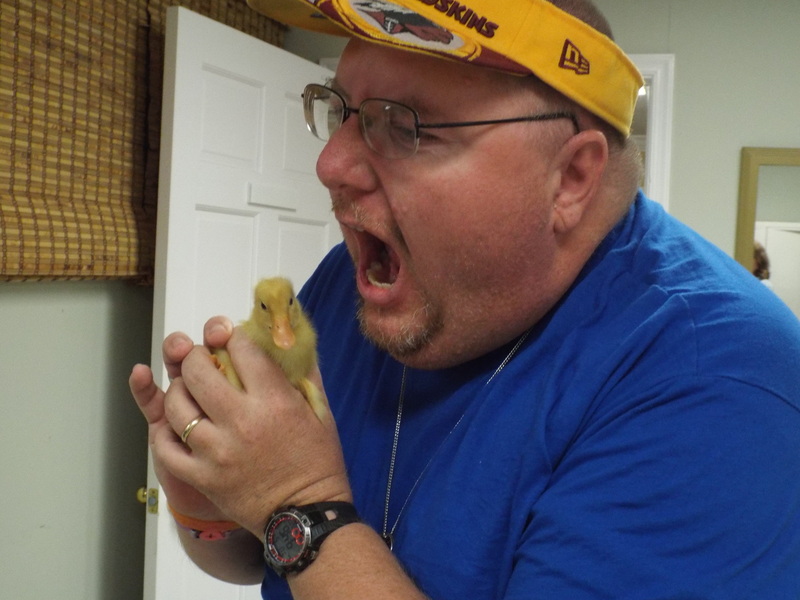 Duck on Matthew. 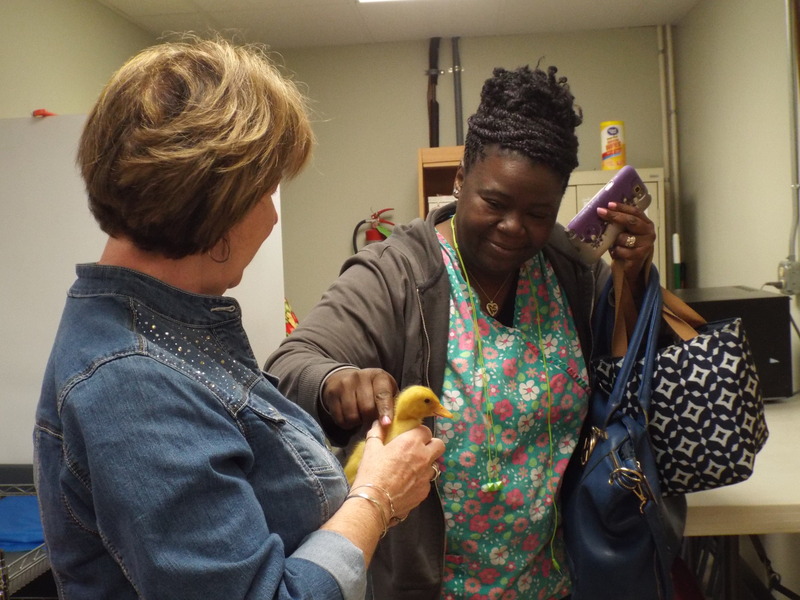 Maryann brought in her new baby ducks to show the group. Amy and Emma have a new friend. 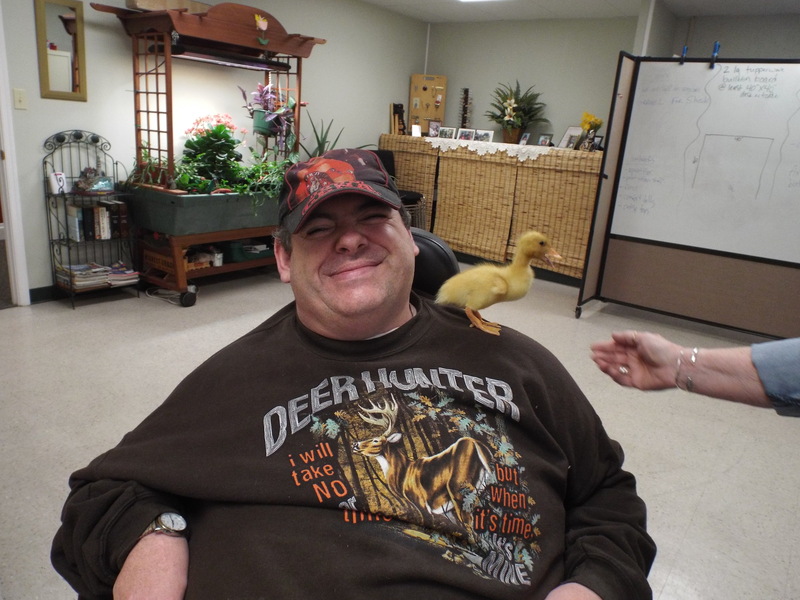 Sherry and Maryann with a duck. 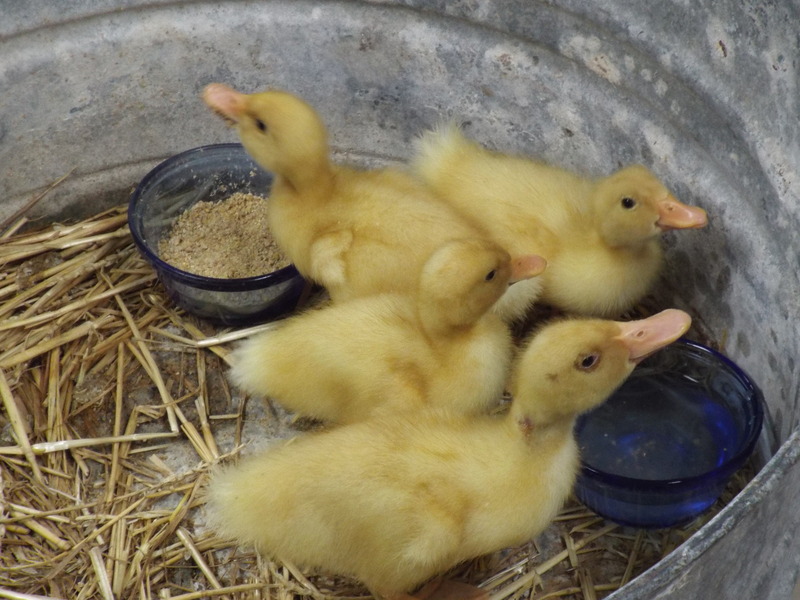 Is CL having duck for dinner? 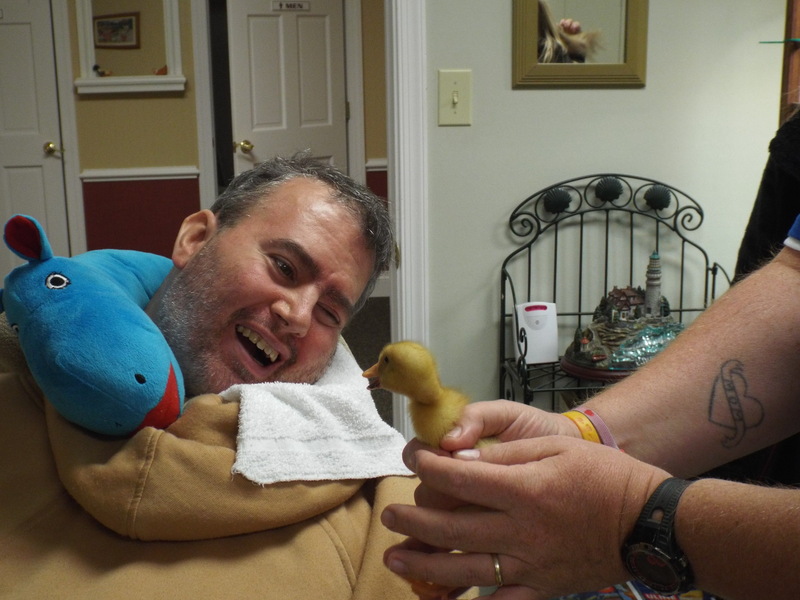 Jason was happy to see the duck. Diane admiring all of the ducks. 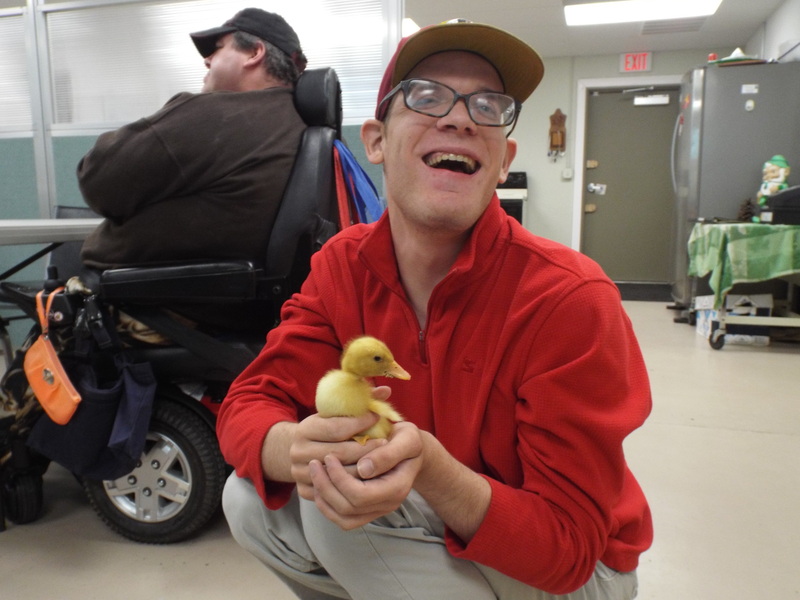 David met a puppy at Animal Control while delivering dog biscuits. 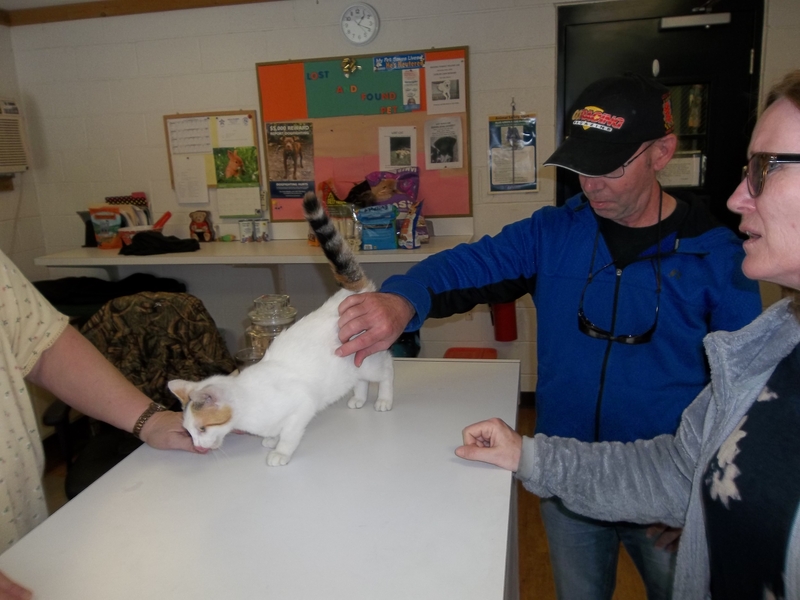 We met a kitty that needs a home. Adrian and Zel updating our First Aid station. 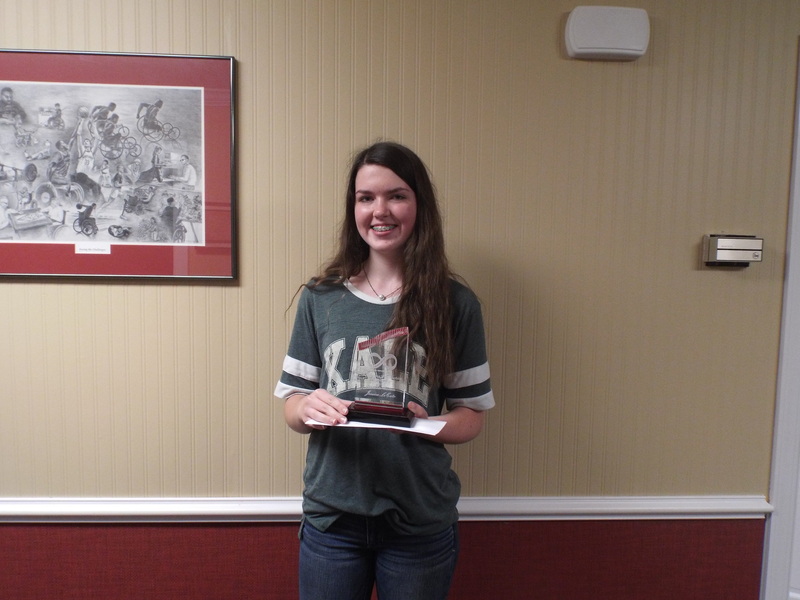 Jessica LeCato, Kate Award Honorable Mention winner, picking up her award.